We are aware of an issue where users with Hotmail email accounts or those using Outlook email client are not seeing their #OhmHour email notifications, and other emails from OhmConnect. We have confirmed that they are arriving but not always being displayed, particularly on mobile devices. Update: We are also seeing this issue with AOL, Comcast, Yahoo and Ymail.com email accounts. Until further notice, we will no longer be awarding streak shields or negative points shields for user with hotmail email addresses who didn't get an email notification. Turn on SMS messages for #OhmHour notifications on your Account page, and rely on text #OhmHour notifications. Try using a different email address, like Gmail. You can change the email address attached to your account on your Account page. 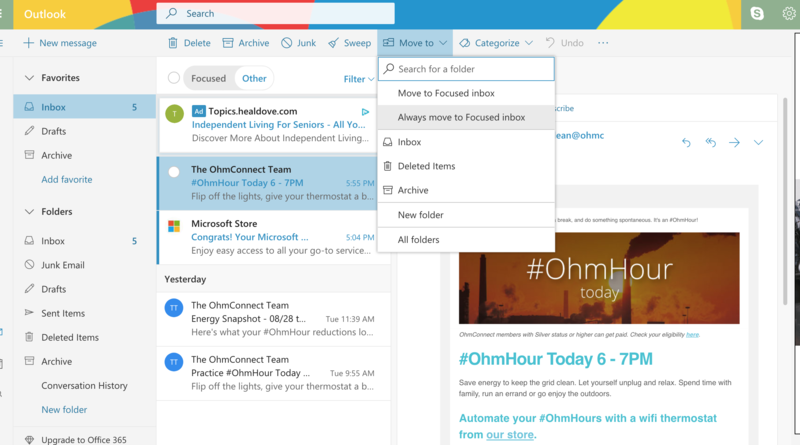 Select one of our emails (from clean@ohmconnect.com, from help@ohmconnect.com) and then choose 'Always move to Focused email' - as in the attached screenshot.